Hey guys! 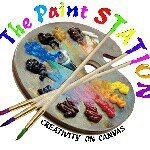 Today I wanted to pop in and share my experience at a relatively new Ann Arbor business called The Paint Station, located on Washtenaw Ave. You may have heard about the concept of this business before, as I’ve read about similar establishments popping up around the country. 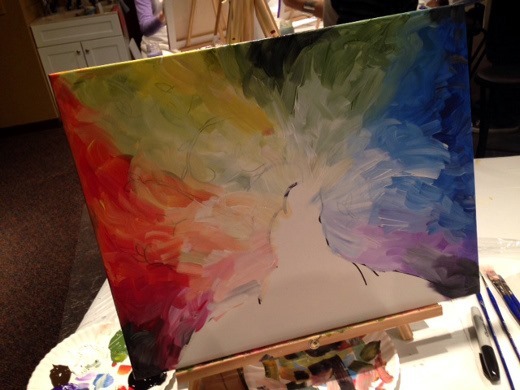 Basically at The Paint Station, you reserve your space at a session you’d like to attend after viewing their calendar, which offers a variety of paintings from which you may choose. 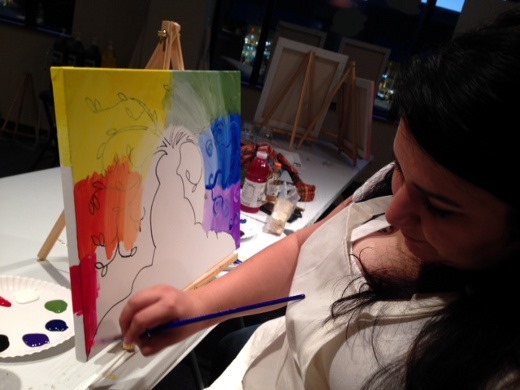 At the class, each participant is provided all the supplies needed to create their masterpiece, as well as the instruction needed to make it happen. First we were given a nearly blank canvas, providing only a pencil sketch of the planned painting. Our first step was the trace the pencil outline with a black sharpie. 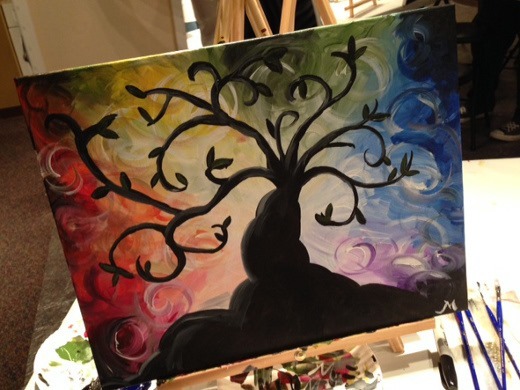 The session we attended was called “Whimsy,” which was the name of this “whimsical” tree painting we created. 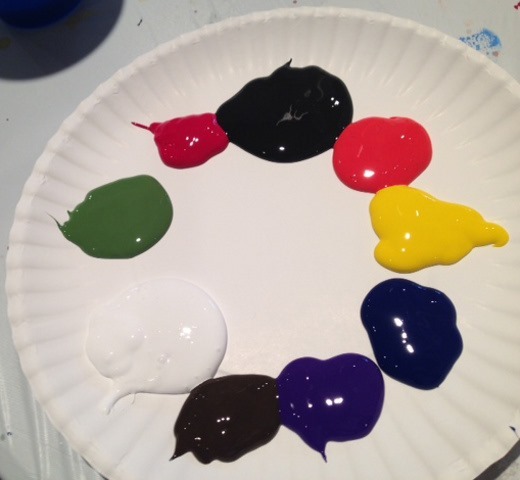 Next we were provided a palette of paint. Time to get excited! Next it was time to start filling in our background. Our instructor performed a demo in the front of the class, gave us tips, and walked around during the class to give us pointers. Another really cool feature of the sessions at The Paint Station is that you’re welcome to bring snacks and drinks (even wine or beer!) 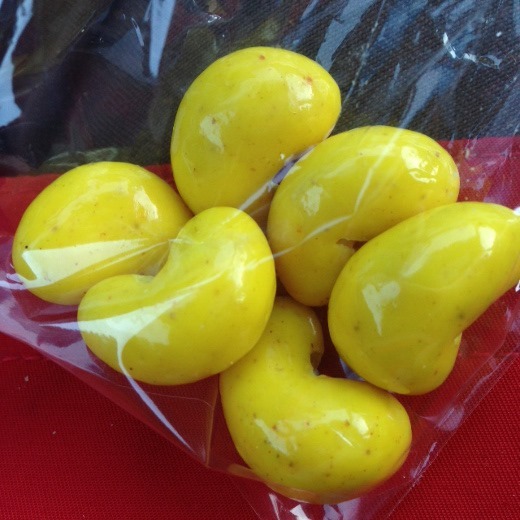 to enjoy during the class. I totally brought a bottle of wine to sip on, as well as some other goodies. 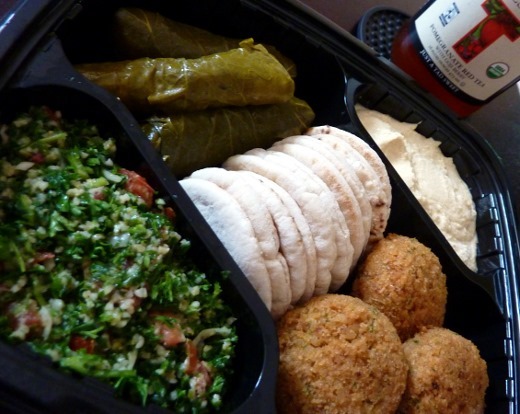 I love this Mediterranean platter from Whole Foods. I was so impressed with everyone’s final product, including my own! A couple hours later – voila! My masterpiece! I am really happy with the final product and I actually do plan to hang it in my house. See what I am talking about, for biggest comeback!? Five Cent Femme’s painting is on the right, below. Big comeback! 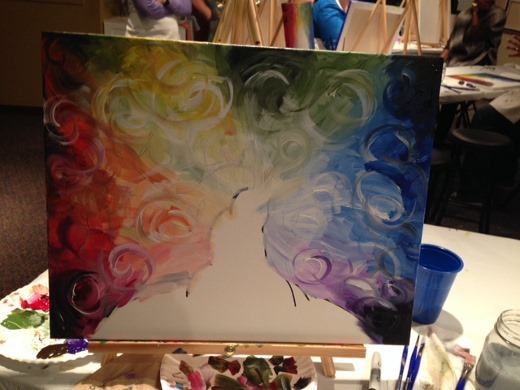 We had about 6 or 7 participants in our class and everyone left with a very nice painting. 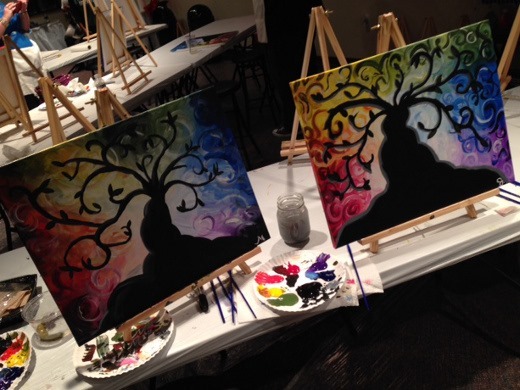 I love how approachable the classes are – truly anyone can participant and create a nice painting. 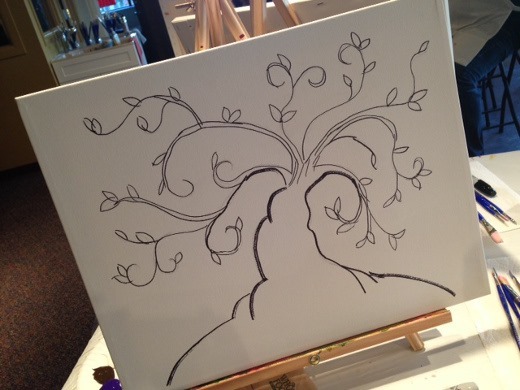 The class offers a run, relaxing atmosphere, and is a great creative outlet for anyone. Since I really enjoyed my class at The Paint Station, I though I would share with you guys. I definitely plan to attend another class in the future. Thanks! Yes, it’s a really cool business. So fun! 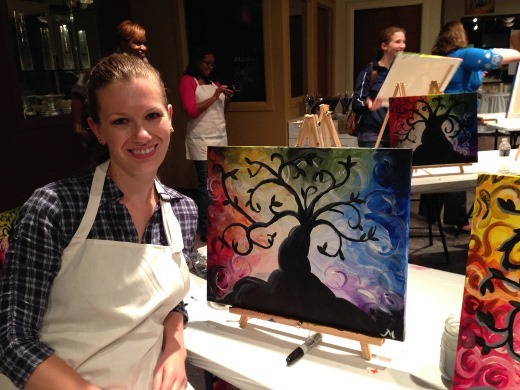 I went to a painting & wine class in NYC this summer and had a similarly awesome time – I didn’t know there was one in Ann Arbor though! Yeah, it’s a fun concept! I was excited when I discovered one locally.